Once upon a time, I only ate banana cake. "I don't like cake" I'd tell everyone, but banana cake was okay - it was different - but if you put icing on it, then it was just another one of those cakes that I didn't like. Icing was the enemy. At home, in our little brown box of recipes, there is a well used blue card. On that little card has a scribbled out recipe, Fay's Banana Cake, an old family friend who made the best banana cake - or so I thought until I started baking. 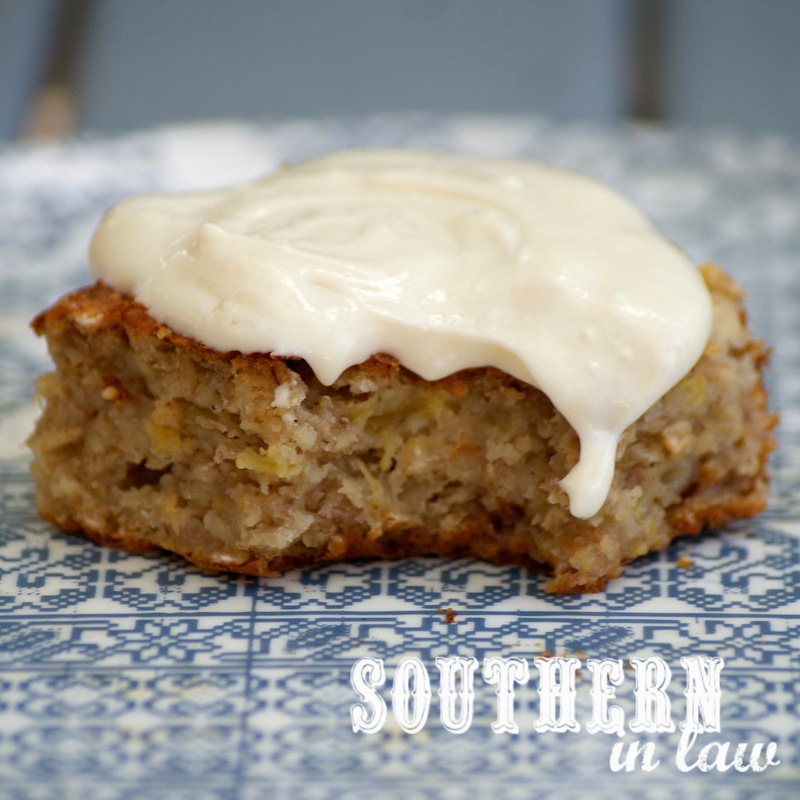 Over the years, banana cakes have still remained a favourite - but now I'm known to top them with cream cheese (add a dash of maple syrup and you have a delicious healthy frosting) or peanut butter - and I also have a million and one different recipes. And I'm not kidding about the abundance of recipes - We have our classic Healthy Banana Bread Recipe, our Polenta Banana Cake, Light and Fluffy Healthy Banana Muffins, Flax Banana Yogurt Muffins, Coconut Banana Muffins, High Protein Banana Bread, Zucchini Banana Cake, Banana Protein Muffins, Coconut Banana Protein Muffins, Sweet Potato Banana Muffins, Banana Pumpkin and Zucchini Muffins - not to mention a dozen recipes for different banana filled breakfast bakes and pancakes - we even have a Raw Banana Cake Recipe! This is also the reason we buy way too many bananas at a time - in the hope that they won't get eaten and we'll be able to make a banana filled recipe! This recipe is a bit different from your usual banana cake recipe. 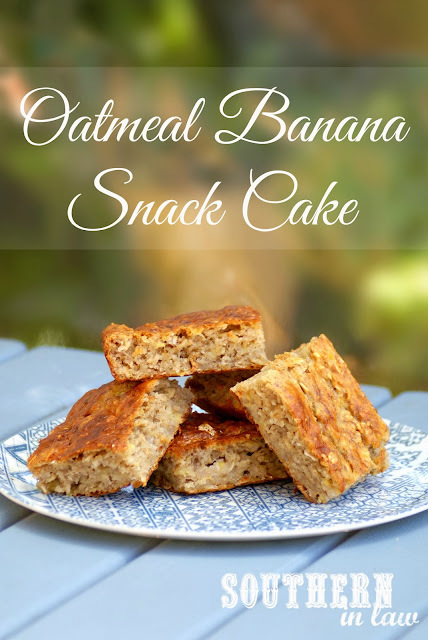 We call it a Banana Oatmeal Snack Cake - but we also had someone say they're more like Banana Oatmeal Bars - call them whatever you like but I promise you that you'll also be calling them delicious. 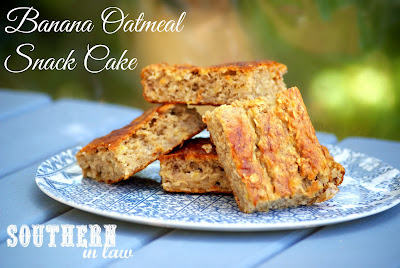 They're moist, slightly dense and oaty and oh so delicious. 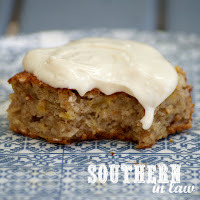 They have very little added sugar because the bananas are so sweet and we like it both on its own and topped with our favourite cream cheese "frosting" mix of cream cheese with a dash of maple syrup. But let's get onto that recipe, shall we? Grease and/or line a 9x13 inch baking pan and set aside. In a mixing bowl, mix together your yogurt, honey, egg, banana and vanilla extract. Add in your dry ingredients and mix until just combined. Pour your batter into your pan and bake for 20-25 minutes or until cake is golden and a toothpick inserted removes clean. *If you like things really sweet, you may want to increase this, however, it was perfect for us! Try using 1/4 cup of honey and increase if still not sweet enough. **I use Orgran's Self Raising Flour rather than wheat flours as I'm a coeliac, however, I do make it for my family with whole wheat flour. GF Self Raising Flour helps to give you a little extra lightness that gluten free baked goods often lack, however, you can use gluten free plain flour. Our Favourite Healthy Cream Cheese "Frosting"
It's so simple, you can't call it a recipe - simply mix your favourite low fat cream cheese (We like Philadelphia extra light) with a pinch of salt maple syrup to taste - add as much or as little as you like to get the desired sweetness. It's not a thick whipped frosting but a spreadable one that's perfect for this kind of cake and so delicious. If you're not a maple syrup fan, feel free to use honey or rice syrup. But tell me, are you a banana fan? What's your favourite banana recipe? Are you a banana muffin fan or do you prefer a hearty slice of banana bread - or maybe something different altogether? I LOVE banana. However, I am lactose intolerant so I can't have the yogurt. What can I replace it with in this recipe? Also, any other suggestion for a topping other than peanut butter? Thanks! Hey Millie, can you have any lactose free yogurts? Otherwise you could try using applesauce or mashed banana. As for toppings, you can top it with whatever you like - frosting, nut butters, glazes or leave it plain!